Don't get me wrong, I already stated here that the current Chinese clone cheapos are 100 times better than the plywood planks people bought in supermarkets in the 1960s/1970s, they are playable and sound something, and anyway a guitar is not a smartphone, you shouldn't get one if you're not ready to learn how to maintain and upgrade it like you'd do for a bicycle… A guitar always has something to teach you, believe me. 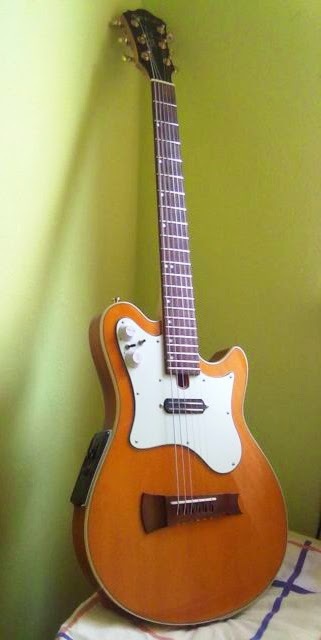 Anyway, this one is on the bizarre side, since it seems to be a hybrid acoustic/electric model with a piezo bridge pickup, probably thinline flat body, a blade humbucker in almost central position and a strange blobby pickguard (at first glimpse I thought it was an Egmond) with controls on the upper horn. The outline is nice, simple and balanced, with the minimum of personality needed, but the frontplate kind of spoils the guitar and makes wonder if the guys understand anything about guitar design... But then who would let such an instrument leave the factory if it's unplayable - these people know about business, don't they? Labels: hybrid guitar, Martinez, What's that guitar? I have a very similar guitar. Mine is branded 'Raven' and is a lefty nylon string version. Same shape but with a flame maple veneer top and no pickguard. It's hollow, with no bracing. Mine has "sound vents" where the pots and switch are. It's a pretty nice guitar. I had to do a little minor fret filing up around the high frets (my nails kept catching) but otherwise it's fine. It is very neck heavy though. The neck is super wide. If I remember correctly, it's 2 1/8" wide at the nut. This and the small body make for a pretty unbalanced guitar on a strap, but it's a great sitting on the couch while watching TV guitar. Sound good too, both acoustically and plugged in. here here! I t would be nice to have more design variety of mainstream guitars. I find it quite odd that musicians still feel the need to buy the usual two or three 60 year old designs of Fender & Gibsons and the myriad of copies. Imagine if cars where sold in the same way. We would all be driving Ford Model T's. Lets face it even the more unusual designs that where considered radical are getting on a bit now.